Linda Kaim of Coeur d’ Lion Behavior Management Westminster, works with a canine client on obedience skills. Sitting on a faded green canvas camp chair next to the farmhouse she shares with her husband, Peter Locaccio, Kaim said she has spent the last 40 years working with dogs and their owners. When owners experience problems with their dogs, their behavioral issues can often be traced back to the beginning days of the relationship. As a child, Kaim had always wanted a dog, but her father was adamantly opposed to the idea, she said. Her father had once been attacked by a dog and feared them. Later, however, he relented, and allowed her to get a pure-bred Irish Setter, a show dog. By the age of 11, she started training dogs. Working with them became her lifelong passion. Kaim has seen dog fads come and go. When the 1996 live action remake of the animated Disney movie, “101 Dalmatians,” starring Glenn Close as the villain, Cruella de Ville, hit the big screens, the public responded by buying cute, spotted puppies by the thousands, without considering the nature of the breed. Often referred to as the Dalmatian Effect, Hollywood movies greatly impact the types of dogs being purchased by American families. What many families belatedly learned was that Dalmatians are extremely energetic dogs and often are not the best choice for a family with small children. Unfortunately, the lesson was often learned too late, and many Dalmatians ended up in animal shelters. Temperament and disposition are major considerations. Different breeds, whether purebred or mixed, have different temperaments, Kaim said. Does the dog’s temperament merge with the family’s dynamics – are there infants, young children, teens, only adults? Are there other pets in the household? Will the dog be kept in an apartment or a house in suburbia, perhaps a farm or a mobile home? Kaim said a big dog may not be the best choice for someone living in an apartment; but any high energy dog, regardless of size, may not be appropriate for apartment living. No matter what type of dog a person owns, it requires regular exercise; some breeds require more than others, she said. 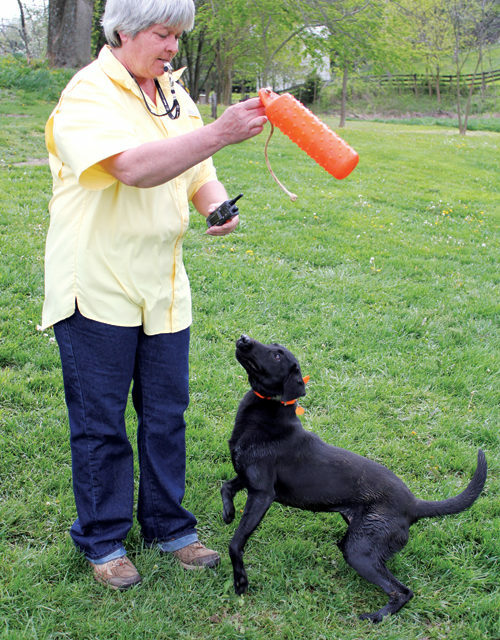 Animal behavioral specialist Debbie Winkler of Humane Domain, Sykesville, an animal training business that offers a wide range of services, said that there are different considerations involved when buying or adopting a dog. When buying a dog, particularly a puppy, the first thing that should be done is to meet the “parents” of the pooch. While both parents may not be on site, the mother of the pups should be, Winkler said. When adopting a shelter dog, choose a shelter that conducts behavioral testing, Winkler said. The animal’s interaction with people, young and old, as well as cats, other dogs and other animals, should have been assessed and the results made available. Inform the shelter adoption-counselor of your needs and life circumstances. Shelter staff are generally very knowledgeable about animals under their care, said Winkler, who is certified by the International Association of Animal Counselors, and the former vice president and president of the organization. Dr. Nancy Powel, DVM,veterinarian and owner of Maryland Mobile Veterinarian Clinic, Westminster, said she grew up on a dairy farm and always loved working with animals. Early in her career, she worked with large animals, cows and horsesÉ But she now works with house pets. Being mobile allows her to do house calls, which enables her to observe the animals in a more comfortable environment, rather than in a clinic. Size is another factor, Powel said. Every puppy is cute, she said, but think about what their size is going to be in a year. Activity level is another key concern. A dog with a high energy level should be matched with an individual who also has a high activity level, she said. Certain breeds also have certain health care concerns, she said. Powel said that timing is also important to consider when bringing a new dog home. Holidays may be a good time to introduce the dog to the household because often people have time off from work. However, holidays can also be a time of added stress and frenzied activity, which could divert attention away from the new family member. There are some online resources on buying dogs. According to Nicky Ratliff, director of the Carroll County Humane Shelter, one is the American Humane Society website: www.humanesociety.org. Here are some other sites; with information on finding the right dog is www.petfinder.com; and dogtime.com/matchup. For more information on Kaim, visit www.lionheartk9.com; for more information on Winkler, visit www.humanedomain.net; for more information on Powel, visit www.marylandmobilevet.com; and for more information on the Carroll County Humane Shelter, visit www.carr.org.humane. Nancy Williams, an animal behavioral specialist with Dogs with Issue, Westminster, offers these tips to consider when choosing the right dog. Friendly A history of having good experiences with people is one the most important criteria, Williams said. The dog should be outgoing, not shy or fearful. Exercise Most problems start with a lack of physical or mental activity for an animal, said Williams. Use exercise pens rather than cages or crates. Crates provide too little space for a young dog. A dog should not be kept in a crate for eight or more hours a day, she said. They need mental and physical exercise. Enroll the puppy or dog in a positive obedience or agility class at least once a year, she recommends. For more information on Williams, visit www.dogswithissues.com or www.certifiedanimalbehaviorist.com. Eight-year-old Bodie, a miniature poodle, was given a second chance when he was adopted by John and Marge Crosby of Finksburg. The Crosbys went to the Carroll County Humane Society intending to adopt an older dog. As soon as they met Bodie, they fell in love. Someone else had also expressed interest in the poodle, so the Crosbys told the staff that if Bodie was not adopted by the other interested party, they would take him. For more information on adopting an animal from the Carroll County Humane Society, visit www.carr.org/humane.